The Terranea Resort can accommodate huge wedding receptions and corporate events. For this wedding, coordinators Pink Rock Events teamed with talented designer and florist Shawna Yamamoto to create a wonderful ballroom decor design featuring fuschia, rose, cream and champagne florals. Handmade white flower artwork adorned the front stage area, as did a mirrored table topped with candles, flowers and glittery boxes. 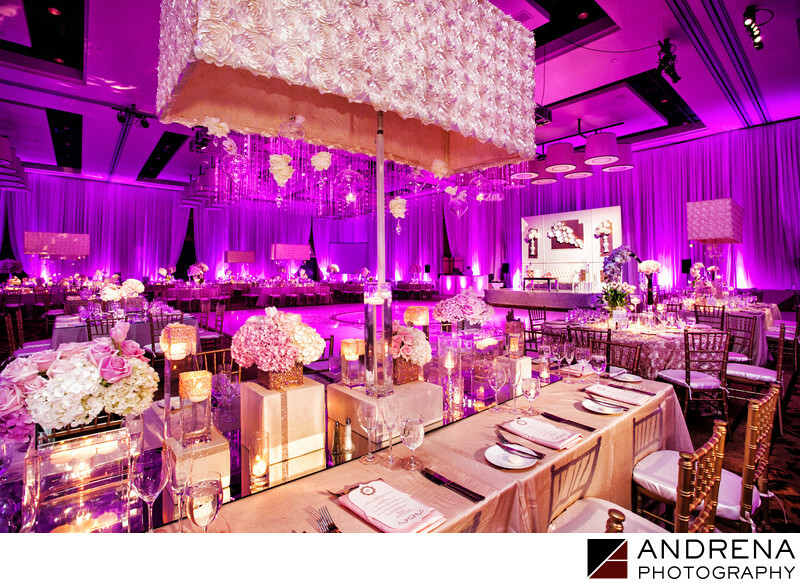 The lampshade details atop some of the longer tables added a fun pop of style to the event. A candle holder full of hot wax fell on me at this event, covering one of my candles (and all my hair) with wax. But I was quickly able to regroup and get back to shooting the event. My wax-covered camera wasn't so lucky, and needed professional repair. The folks at Canon Professional Services said they had seen a lot of camera damage scenarios, but had never before seen a camera covered in wax.